So, you’ve started playing regular 5-a-side football, result. You’ve learnt that 3G refers to more than just mobile internet, and it’s revolutionised the way you think of football. You’ve waved goodbye to the muddy bog of Sunday league shame. You’ve joined the purists, and you’re not looking back. Problem is, no-one seems to have told you what type of football boots are best for the surface you’re playing on. Don’t worry, you’re not alone. A surprising number of regular 5-a-side players aren’t sure what footwear is best for 3G and artificial turf, or for indoor pitches either. We’ve got your back; this guide will show you the best football boots for all varieties of 5-a-side pitches, whether you’re playing outdoors on artificial turf or if you’re looking for the perfect footwear for indoor futsal. 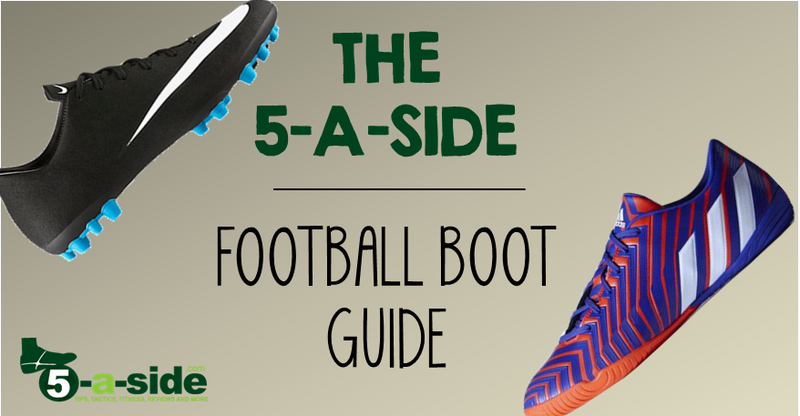 Here’s how to choose the best 5-a-side boots for you. It is amazing the difference the right footwear can make to your game. Having the right grip and traction allows you to play to your best and with confidence. Nobody wants to fall victim to a Gerrard-esque slip. But there are a lot of people that aren’t wearing the right footwear for the surface, and don’t see the detriment it might be having on their game. As the big sports brands like Nike, Adidas, Puma and so on have become aware of the popularity of small sided football, they have begun to cater very well for it with their equipment. Often many boots will come with different “sole plate” options. This is what you need to pay attention to, as this refers to the type of grip or stud on the base, and are tailored to different types of ground. The great news is, the small-sided player has never been catered to as well as they are now, with so many different options. The best boot varies from person to person, depending on things like playing style, design, size, comfort, fit and so on. Knowing what key things you should look for allows you to make the right decision to suit you. You don’t have to spend a fortune to get a great boot. If you’re shopping in the top of the range then great, but it’s perfectly possible to get yourself a good boot that is going to last you years for as little as £30. By this, we mean the plastic grass with black rubber crumb. The place you play might be claiming to have the latest 4G, 5G or even 6G – these days we seem to be tantalized with an ever increasing amount of ‘G’ – but basically if it’s a long-pile carpet like this one then we’ll call it 3G ‘artificial grass’ (or artificial ‘turf’)’. The golden rule is: don’t wear blades or full studs on artificial grass. Many venues have rules against this (although they do seem to be flouted all too often). They can damage the surface, but more importantly they are actually dangerous. These boots are designed for softer ground, so will provide too much traction. This is all well and good until you turn quickly and find your boot has caught in the surface. Many a knee has been put out of action in this way, and there are some horror stories out there. Do yourself a favour and don’t risk it. As long as you get the right sole-plate, the rest of the boot design is really up to what you prefer. For example; you may want a light material to feel the ball better and improve your touch, or you may decide you are after something that will provide you a little more protection against the lunatics who insist on blades and invariably come over the top on you in a tackle. 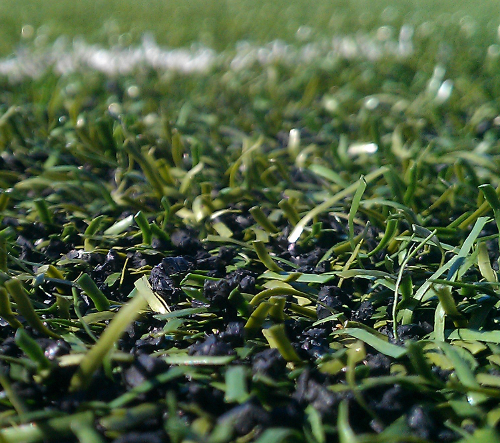 The “artificial grass” plate has emerged as a new phenomenon over the past few years. This is often shortened to ‘AG’ in the title of the boot. 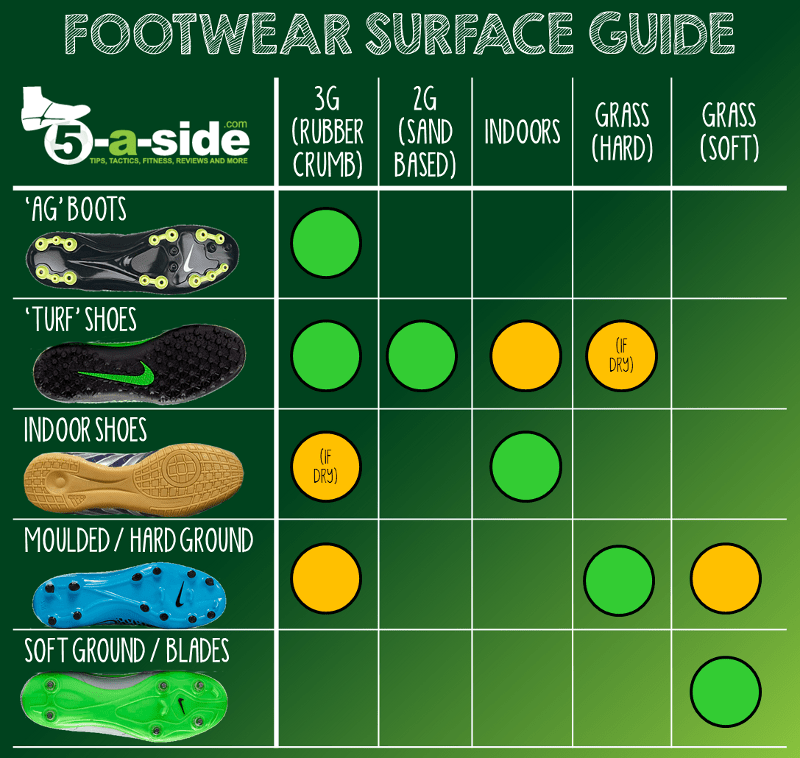 These sole plates vary somewhat but in general take the form of rounded, plastic studs which are shorter in length than normal studs, even compared to standard firm-ground (FG) boots, but longer than the dimples on a normal turf trainer. These artificial grass plates are designed specifically with 3G pitches in mind. They provide the right amount of grip and are excellent at providing a quick burst of acceleration when required. Note that these shouldn’t be used on traditional (short-pile) astro-turf surfaces. 2G pitches are generally either sand based, or more like a strange carpet. They are becoming less common as 3G is generally viewed as superior, but there are still plenty of them around. Not soft enough for an AG plate, but not quite solid enough for an indoor shoe. The best boot for an astroturf pitch is the “turf” boot. These have a sole plate that consists of many small, dimple-style studs. These will provide the best possible traction on this surface. If you’re anything like me, you might have splashed out on a pair of these in secondary school and thought you were the absolute business. Wearing them not just for football, but as a fashion statement to complement any outfit. The upside being you were always ready for an impromptu kick-about. The downside being you looked like a total prat. A big benefit of the turf boot is that they are also suitable for use on longer-pile artificial grass pitches. They won’t give you the optimal performance of an artificial grass boot, but they’re not far off. The other big benefit is that they’re much more versatile than the AG plate: you can use it on 2G (the sand-based surfaces), 3G (the rubber crumb variety) and even indoors if the sole is non-marking. It could save you having to buy several types of boot. The nature and requirements of futsal or other indoor games are quite different and serious indoor players should look to buy some specialist shoes that keep their feet low to the ground for uncompromising grip and manoeuvrability. You can’t beat a good ‘vulcanized’ rubber sole (obviously made and assembled by real Vulcans) for some indoor action. If you’re an occasional player you can get away with turf trainers, but you could find yourself sliding a little too much because they typically don’t have anywhere near the same levels of grip. The best indoor or futsal shoes will have soles designed to deliver grip, but also easy turning. The circular / hexagonal designs under the ball of the foot are designed to aid your pivot point as you quickly change direction. Whatever you do though, make sure that the shoes you use for indoor use are non-marking, otherwise you’re likely to have an angry caretaker chasing you round the gymnasium when he realises what’s going on. These days there are some really good indoor boots available, and they are generally a little cheaper than their outdoor counterparts. What do you look for in a boot? There you have it, the definitive roundup of which boots you need for 5-a-side or futsal pitches. Now you have no excuses for the wrong footwear, it’s time to stop blaming your wild shots on your standing foot slipping. As we’ve said, everybody is different. 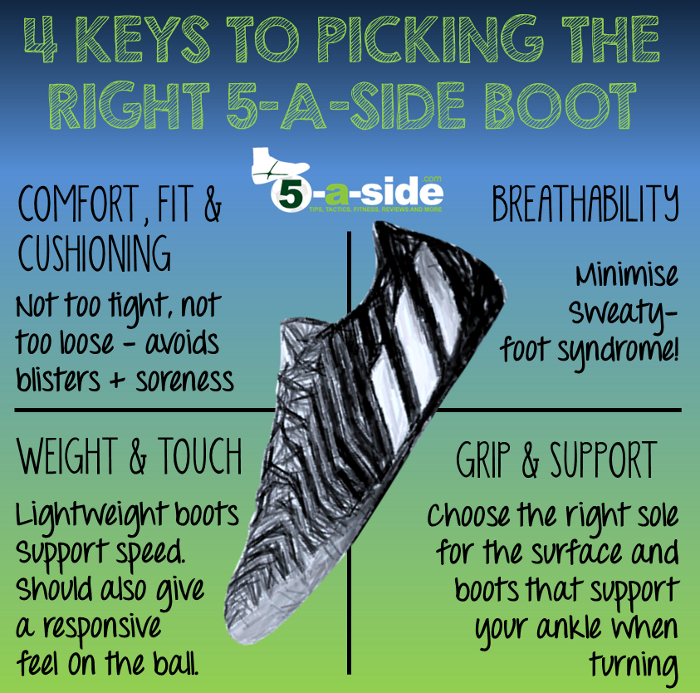 Let us know your tips for getting the right boot. Do you have a boot that has lasted an impressively long time? Let us know in the comments below. We have to wear moulded or blades!! Is this true? That is the first time I’ve heard anything like that! That shouldn’t be the case – if the pitch is properly maintained by them then they shouldn’t have a problem with grass being flattened! @The Gaffer Which Artificial boots do you have? Sorry for the delay replying. I had to look up exactly what the pair I’m using is and I’ve found out that they don’t sell them anymore. They must have been at the end of their run. Thanks for replying. Do you have Nike Astroturf Boots as well? Yep, everything is Nike for me. It’s not so much the brand, but the fit. I’ve found that for my wide foot Nike are usually pretty good as long as I avoid their narrower collection. Anyone ever played using indoor shoes on 3g pitches? Ive been playing with the magistax indoor sole version in both indoor and 3g pitches. Found to be excellent so far on both surfaces in terms of grip and traction. Since 3g pitches might be different, I wouldn’t recommend them for everyone. However for me its been great, I also have elastico superfly IC which I found too narrow(I have wide feet I think), and predator instinct 2014 AG which I didn’t like as much as the magistax. The sole design on magistax IC seems to give me very good traction and grip even on the 3g pitch I played on. The cushioning seems much better than the elastico superflys and without the studs of the AG boots, I feel more mobile with the IC soles. All the nike footballx IC soles have the same design at the bottom, if you have a pair I think its worth trying it out on a 3g pitch. Can always go back to AG if you need the grip. Hi Kevin, thanks for the comments. There are some useful tips in there. I have played on 3G with the indoor sole and have found that it works great but ONLY if the surface is dry. If it’s wet then I have really struggled as I’ve needed something with a bit more traction. That’s why I’d always wear my astro trainers or my AG soleplate on 3G surfaces now. I don’t know if someone shares my opinion but here I go. I’ve been playing on 3g pitches for over a decade. I actually didn’t have to chance to play on real grass ever where I live. It was mostly 3g pitches with some asphalt time in the “hood”. -However, when I play on large 3g field (8 a side and bigger) i tend to prefer AG soleplates. They give me a solid base under my feet for more powerful shots and longer range crosses without much fuss. Quicker sprints are easier on the wings and comfort isn’t greatly a concern since I don’t touch the ball as much. Overall I prefer the “cleats” feel in these situations. Of course that’s not to say that AG’s benefit do not translate to 5 a side pitches (more solide base and better traction) but the feeling of astroturf trainers suits more. I want to stick with AG on small 3g pitches but I always trnd to come back to astros. Sorry for the lenghty post but I felt the need to give my honest opinion. Anyone shares the same feelings? Josepe, I don’t think you’re alone with that one. I’m often not sure whether to go with the AGs or the Astros. I’ve only been using AGs for the past 4 months, but I am a huge fan, especially where conditions are wet as they give you extra grip. But when it comes to touch, I’m still with you with the AGs, especially where I think I might need to use the sole of my foot a lot. I wonder if anyone else feels the same way? I recently picked up a pair of Nike Elastico Finale III’s as, after hours of looking about, found they were widely regarded as the best indoor boot available. Unfortunately for me, they seem very narrow on the top of the foot, a narrow taper to the toe, but loose at the heel. All of which resulted in some loose control and sloppy passing during the game and some blisters after it. Admittedly I could just be rubbish at footy (as has been mentioned once or twice) but its back to my old battered Puma V1.08’s and the search for new boots begins again… Any recommendations? Anth, That’s such a shame that you’ve found them too narrow as it’s a good looking boot, for sure. You’d always expect a period where the boots need wearing in, but your first game sounds like more of a nightmare than it should have been! In terms of the wide boots, you might have more joy with the magista or the tiempo in the nike range, but for you I think you’re best off going and trying some on in a shop before you make another purchase. There seems to be a lot of variability these days, even between the different models in a single manufacturer’s range! I tried on a pair of the new adidas astro turfs the other day and they were ridiculously tight but i struggle with wide foot syndrome so they might be perfect for you. My bro is opposite. He has narrow feet and uses the mecurial AG boots. I’m very much a wide-footer and I’ve just got new nike AG boots. They’re great – I’ll find out the name of them as they weren’t expensive either. I had an excellent pair of Nike Tiempo astros with a sole that was astro studs made from the beige rubber for the indoor surface. They lasted me nearly 10 years (admittedly I didn’t play regularly throughout that, but they probably stood 3-4 years of punishment in there). Since they went to the great wardrobe in the sky a year ago I have really struggled to find a pair that fit nicely. I have narrow feet so I often wear two pairs of socks to compensate and then I feel like my touch isn’t as good. Any recommendations for narrow astro trainers would be gratefully received! I’ve currently got Puma King astros which are a bit too roomy. Philip, love your ‘great wardrobe in the sky’ comment. I’ve seen many a good boot go there. I’ve got the opposite problem to you: i have very wide feet. So I’ve had pairs in the past that I’ve tried which i thought were much too narrow and returned them. For the likes of you and I with these needs, sadly it’s hard to order online without trying them on first. I’ve actually found the puma range to be narrow in the past (though I had kings and they were fine) but I’ve also found adidas in general to have narrower fit than Nike. Have you tried any adidas boots? Thanks for the suggestion – I think Adidas are probably the next stop for me. I’ve got a pair of Adidas indoor futsal trainers which fit quite nicely but I find it to be a complete lottery. I went looking a few weeks ago and tried on size 12 Puma which was a tighter fit than the size 11 Pumas I’ve got now! Stumbled across this thread when checking out types of boots, take a look at the following methods for lacing up (used for running trainers normally), I get bad bad pain in my feet as boots are too narrow (they are perfect size as any bigger would be too long, plus socks ain’t the issue) I have a wide forefoot so am trying that method on my nike magista onda tf which are a bit narrow for me, laced up in the wide forefoot method but yet to play in them, hoping this saves my feet! Hope it helps! Thanks ussy for a really useful comment. Some of the Nikes are getting very narrow these days! Ha ha. Yeah strange. I just prefer the football boot feel. I feel like astro’s have too much cushioning. I have AG Tiempo’s. Got them for 11-a-side intially but a new injury and a new baby stopped me playing weekends and i just haven’t gone back. Started playing 5’s in them and although i do love my nike astro’s i’ve been using my tiempo’s. Good choices all round there. I’m looking at the Nike AGs. I think I’ll get a pair. The Skipper, who wrote this article loves his. I was so sceptical at first but he’s got a point. Astros are fine when it’s dry, but can be slippery when wet – especially if you’ve worn down the sole as much as i have! Hope the new baby is letting you sleep! Just thought I’d chime in and echo that, really made a difference to me. I was playing on (at least) 5 year old astros until recently and on anything but a bone dry pitch would really struggle to turn or change direction quickly. Now with some proper AG’s (I went for some Nike Mercurial V’s), as a defender I’m finding people are not able to turn in behind me or accelerate away from me as easily or often as was happening before. I need to join this revolution! Is this article based on the email i sent? Ha ha. Very good. Comfort wise nike do really good astros. But for me they feel to much like trainers and therefore i prefer my AG boots. Darryl, Nike do some good astros don’t they?! I’ve trusted them for my pair which has lasted me nearly 5 years now. I’m thinking about buying an AG pair after struggling with grip on wet surfaces during the winter. I’m probably the opposite of you though, I like the trainer feel. Football boots these days feel a little bit flimsy to me, whereas a trainer seems to have a bit more to it. I just saw the email! How weird that we wrote about the exact same question you asked. Great minds think alike, eh! I just got myself a new pair of Aritificial Grass boots. I play on 3G once a week and had been playing in ‘astros’ up until now. I’ve found it’s made a difference for me – able to change direction more quickly. I used to occasionally slip, hasn’t happened yet with these boots. I feel it seems to have helped me play slightly better – early days yet though. Dave, your comment and Darryl’s below has persuaded me that I need to give these new-fangled AG boots a go. I’m going to invest in a pair.